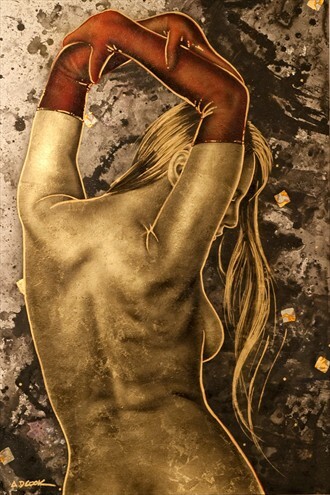 I create original fine art nudes and figurative artworks on specially prepared canvas and hand-grinded metal. Most are painted life-size and larger, and feature a contemporary approach to this time-honored genre. My imagery bursts out of traditional art forms, which leaves viewers appreciating their sensual nature, beauty and detail. My metal creations have been compared to sculpture and holographic mediums – there’s a dimensionality and motion visible in every artwork. My paintings are truly unique, not only in their painting process, but also in their preparation. I meticulously prepare my canvas and metal surfaces specifically for each intended artwork. Every painting goes through several steps throughout its creation process. Using a wide variety of mediums, each piece is crafted from beginning to end, producing an original artwork with the idea in mind of creating something unique and inspiring. My pearl canvas series and metal paintings change appearance with shifting light throughout the day. A painting viewed by morning sunrise looks entirely different at evening. The very nature of my artwork provides long lasting beauty and enjoyment. My hope is that they bring you lasting pleasure, as they do for me. 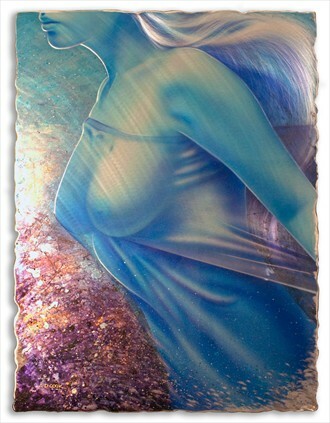 went for a slow stroll through your website and fell in love with your art work again...gorgeous !! And, yes, I will be in Vegas next month. Laying out dates this week. Loving seeing some beautiful airbrush work! One of my favorite ways to make images. You are rocking it!